It’s simple: we want to help you love the skin you’re in. Shining with confidence is an incredible feeling, and we hope to give every one of our patients that experience. Denver plastic surgeon Gregory Buford, MD, FACS is honored to have helped thousands of women and men look their very best over the years—and he would love to help you too. Looking refreshed and feeling beautiful every day is an incredible gift you to give yourself, and we would love to show you how. Here at BEAUTY by BUFORD, our top priorities are your health, happiness, and comfort—and we have the results to back it up. We welcome you to join our thousands of happy patients who love the skin they’re in thanks to smart aesthetic medicine. Contact us to get started! Eat, Drink, Heal: The Art and Science of Surgical Nutrition is not your average diet book. It’s a labor of love written by Dr. Buford who hopes to educate physicians on surgical nutrition and empower patients to be proactive in their health and healing. With expert guidance on supplements, healthy how-tos for healing food and drink, and information about how you can ensure you heal optimally, Eat, Drink, Heal is a must-read for anyone undergoing elective or non-elective surgery. 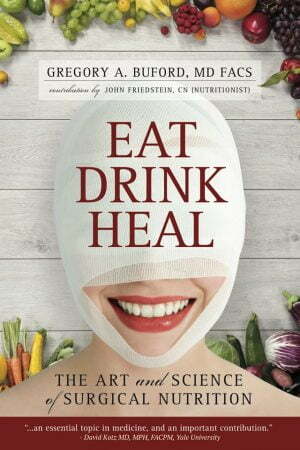 Purchase your copy of Eat, Drink, Heal here!